We are slaves to cardio machines at the gym, when the weights are where we really should spend more time to get the biggest bang for our exercise buck. I’m just as guilty of this as anyone else–here’s my evening’s cardio. Not too terrible, but could be better. In any attempt to lose weight and get healthy, exercise is a must. I know, biggest understatement of the year. I don’t claim to be a fitness expert but I do know that to be fit, one must reduce body fat percentage, increase lean muscle mass, increase stroke volume, and increase VO2 max. These are things the average bear doesn’t think about–hooray for having a biology background! One of my personal fitness goals is to get my resting heart rate down to 60 beats per minute. Right now, it sits at a healthy 76 bpm, but I want it lower. To lower my resting heart rate would mean that my stroke volume would be increased and that my heart would not have to work nearly as hard when it pumps blood. Stroke volume is the quantity of blood ejected by the heart’s ventricles with each beat. The higher the stroke volume, the fewer times in a minute the heart has to beat to circulate blood around the body. And the fewer times in a minute the heart has to beat, the better shape the heart is in (for the most part) because it doesn’t have to work so hard to do its job. And how does one increase stroke volume? 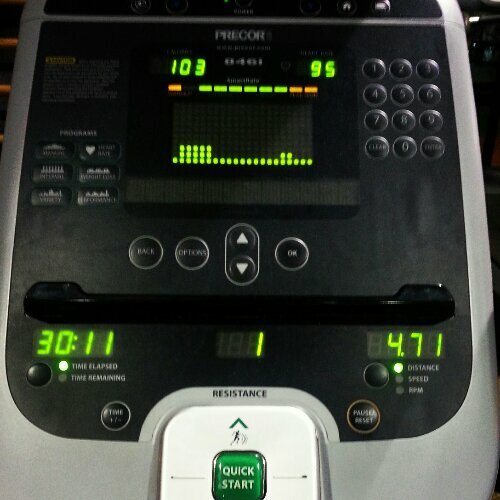 Doing cardio exercises, of course. One of the things that we often forget is that the heart too is a muscle, and it needs to be worked out just like our skeletal muscles do. So we spend excessive amounts of time on cardio exercises, whether it is walking/running, using the elliptical (which I am convinced I will never learn to use because it terrifies the hell out of me), riding the stationary bike, or Zumba-ing, to the exclusion of strength training. 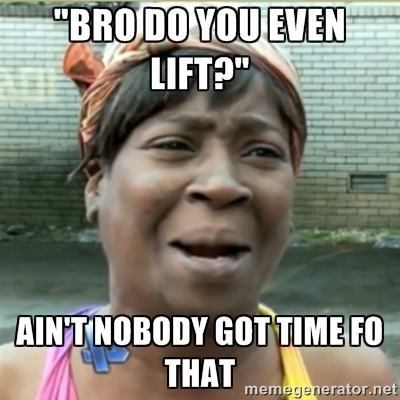 Sometimes we spend so much time devoted to cardio activities that we forget we have to do strength training too. I am just as guilty as the rest of us at forgetting to work in strength training and that is something I promised myself I’d do more of as I move into 2014. But you have to make time for it…or risk losing lean muscle mass, which helps burn fat and takes up less space as it is more dense than fat tissue. I think next time I do upper body, I’ll add in chest press too, as well as some more upper back exercises like the seated row. I’m trying to remember all the stuff my old trainer used to have me do, and using that as my reference point. I also need to see what other machines our gym has, and learn some exercises I can do with the free weights too. Funny, I thought about that time in my life–the time I hired a personal trainer for a year. I did build some muscle mass, but during that entire year that I worked with him, I lost and gained the same 10 pounds all year long. And I was a hundred pounds heavier then than I am now. When I sat down on the machines to do my exercises, it was so much easier than it was 100 pounds ago. So many things are easier now, 134 pounds lighter than I was 7 months ago! Tomorrow I may go back for a leg workout. I haven’t decided yet. But I know strength training is something I need to do on a consistent basis to help tighten up some of my loose skin, to tone the muscles underneath it all, and to increase my body’s capacity for burning fat. Building my lean muscle mass is going to be extremely helpful getting these next 90+ pounds off of me, and what better time to start building it than now? 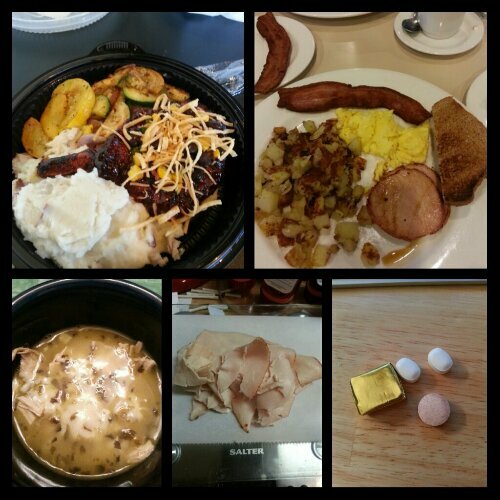 Today’s food choices, from upper right: scrambled egg, Canadian bacon slices, bacon slice, most of a slice of whole wheat toast, couple of spoonfuls of hash browns; multivitamin and calcium supplements x2, iron supplement; deli sliced turkey breast; Mexican chicken lime soup with Monterey jack cheese; bbq pork chop with black bean and corn salsa and tortilla strips, sauteed zucchini and onions, a bit of mashed potatoes. This entry was posted in biology is awesome, cooking, daily bites, eating, exercise, goals, la guerra, post-op, the body is a funny thing, the sleeve, vsg, weight loss surgery, werk! and tagged biology is awesome, bro do you even lift?, daily bites, eating, exercise, fitness, fitness goals, I work out, omg I eat carbs!, planning for success, post-op eating, post-op life, she's got skillz, sleeve gastrectomy, strength training, VSG, vsg realness, werk!, WLS, workin' on my fitness. Bookmark the permalink. That looks awesome – what were the substitutions?? I made my own chicken stock from a couple of rotisserie chicken carcasses I had in the freezer. I used more chicken breast than the recipe calls for, and I roasted them off in the oven rather than boiling them. I also added adobo seasoning and doubled the amount of lime juice because with the amount called for, the lime flavor didn’t come through at all. I also simmered the soup for a longer period of time.